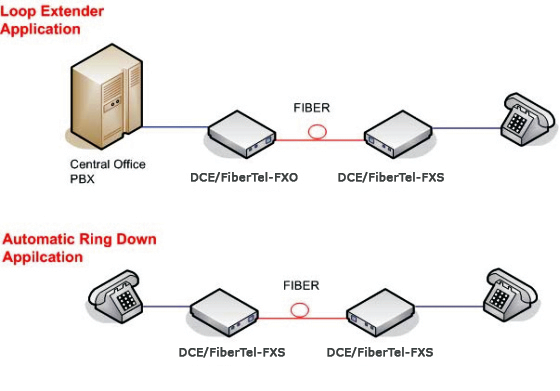 DCE/Fiber-Tel is a fiber phone line and telephone converter extender is used to connect PSTN voice signals to distant Plain Old Telephone (POTS) devices. DCE/Fiber-Tel provides a fiber media transport for POTS transmission and features an RJ11C for copper connection. A pair of DCE/Fiber-Tel is a required implement to an end to end system. FXO mode connects to a telephone line or PBX and has the ability to detect ringing voltages and to act as telephone. FXS mode is the reciprocal unit and has the ability to act as PSTN and connects to a telephone device. 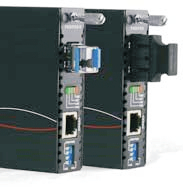 When the DCE/Fiber-Tel card is placed in the DCE/RM20 with SNMP management, in-band allows viewing the card and remote converters status, type, version, fiber link status, on hook status and alarms. Both card and remote can be configured to enable or disable the port, reset the port and set the FXO or FXS mode.